All over the world, “Moving Wifi Spot” start. Internet Environment, will be closer to you than now. 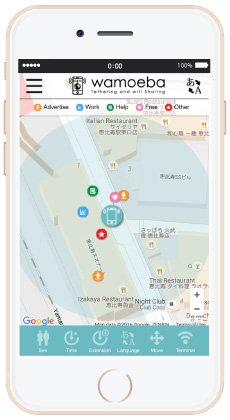 The Share service connects the "work" and convenient" in the Internet share of tethering on your mobile phone. Security and Convenience by Internet environments. During use Mobile Phone, During tethering to PC or tablet PC, Internet is working slow. You can’t find the Wifi spot. Always Internet Environment was must have been Nearby Me. The Most Convenient and Speedy, Through With You. Internet is not stable, Mobile hotspot don’t have, Wifi Spot isn’t vicinity, Once before now, you must have been certainly troubled. At that time, we can get the Internet environment by nearest person and we can get it anonymous. Until now, you were difficult to ask to friends and acquaintances and others. But, you will be able to share the Internet environment each other feel free. We offer the place here. Growing every day. The most close for you. The theme is “people” and “mobile phones”. “Smartphone” users are about 55 million peoples in Japan.“Smartphone” users are about 190 million peoples in USA. There are a lot of the person want make full use of mobile phones, and one in need. In that case, “Let’s help each other together!” So, WAMOEBA was born. You don't need the place and baggages. If both have only a mobile phone, both can do it! The Wifi Spot will more and more increasing, because everyone can start right now. Look at…. Tethering is displayed on the map and locate the other party (jointers). Check the nearest jointers with GPS function. You elect the intended use, and request it. Notification will be sent to the Sharing Host who is displayed most near on the map. When a request to jointers is approved you will receive a wifi name and password. Trying to use the Internet to connect to your device. Please rate the jointers when finished utilization. To another evaluation and the evaluation points out of 5 you can enter text in any. The using fee is free. This mechanism is to pay only the sharing fee. The fee doesn't change in early morning, late night, 24 hours and 365 days! Anytime, anywhere you can use. This is the most smart wifi connection way. You can attract immediately the nearest wifi spot with one-tap. You can also be a request to move the jointers is wifi spot in the communication stable area. 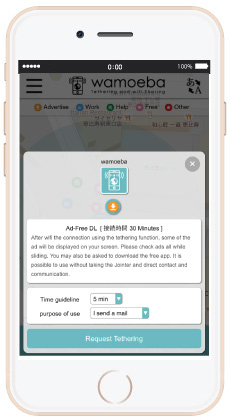 wifi spot of wamoeba can move freely. 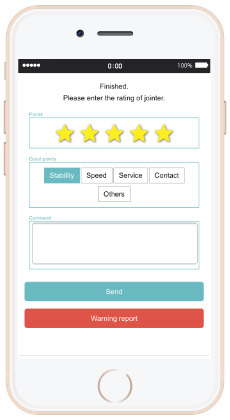 Rating has been published in jointers and connectors. During the connection with the compassion to the other, let's try to be a great time. Rating on the basis of, offer service that can use with confidence. Also, tethering destination can also be gender specified in the option conditions. Tethering conditions you can check in advance. It is also possible to use directly without taking the contact and jointers. Communication is also not good, you can use with confidence. If it is possible to agree to the conditions, you can get by using the Internet environment. Instead, please give to meet the demands of jointers. Why work in SmartPhones ? There are various ways of working in the world, anywhere in the spare time. But, there aren't many the work that is able to immediately begin to work. Now, it is possible to start with a single mobile phone. The body is completely free. Because data communication sharing of mobile phone also in during business. While going to work or school, you can work even in the middle of lunch and hobbies. Also, it is also possible to request the help of business and private work on an hourly basis. There is also a method that employs a person as consideration for the tethering only now short time. It is convenient work. So, has been perhaps chosen. We have been certified as "PAY.JP Partner" of PAY Co., Ltd. which is a settlement company. We opened a first laboratory specializing in the development of new services in Shibuya-ku. We acquired some shares of a matching service company (Nomisuta, inc.). We would like to inform you that we have established a Jewelry Brand Company（Bank of Jewelry,Inc.). Our office will be closed from 11th to 19th August due to Summer holidays. We moved the Japanese branch office to Shinjuku-Sumitomo Building26F. We converted into LUXX a subsidiary. We would like to inform you that we have established a Vacation rental Company（Capita,Inc.）. We began supporting Public works&Construction industry Company（Shimada construction,Inc.）. We began supporting Kenbicho Academy association. We would like to inform you that we have established a Beauty business Company（Healthy Design,Inc.）. We would like to inform you that we have established a real-estate Company（Perfect Room,Inc.）. We would like to inform you that we have established a Entertainment Production Company（Gaitarejanaiyo,Inc.）. We sold the service （Bank of Ticket）. We began supporting Advance Medical Sports Academy association. We converted into U-creation a subsidiary. We established the Japanese branch office. and the immediately available mobile phone by e-mail.